Graham Elliott designed and directed some of the first ever motion graphics at MTV, after graduating from the Royal College of Art, London. He designed rock band, Living Colour's record sleeves, directed their 'Glamour Boys' music video and designed their stage design for the tour with the Rolling Stones. 20 years later he is directing and producing commercials, music videos and documentaries. He has worked as a creative at Saatchi and Saatchi, directed commercials for Coca-Cola and music videos for Puffy in Tokyo as well as projects in twenty plus countries. Teaching motion graphics and music video at the School of Visual Arts, New York for more than 10 years, Graham was also keynote speaker at the ‘International Motion Festival, Cyprus’ in 2012, 2015 and 2017, as well as keynote speaker at the Varoom Innovators’ Conference in Birmingham, UK 2016. His feature documentary 'New York in Motion' was featured in over a dozen film festivals worldwide. 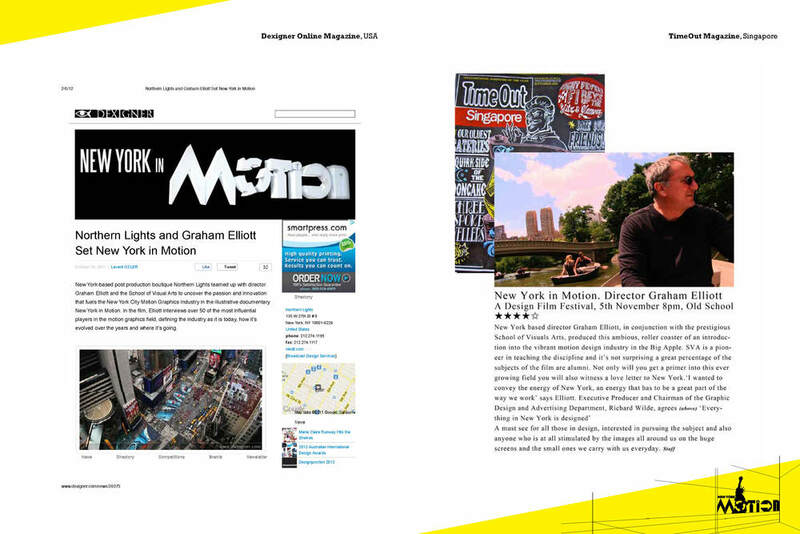 Press cuttings for Elliott's film 'New York in Motion'.